As Tinseltown's biggest night unfurled, no less than six A-list celebrities proved that sustainability and glamor were far from mutually exclusive. 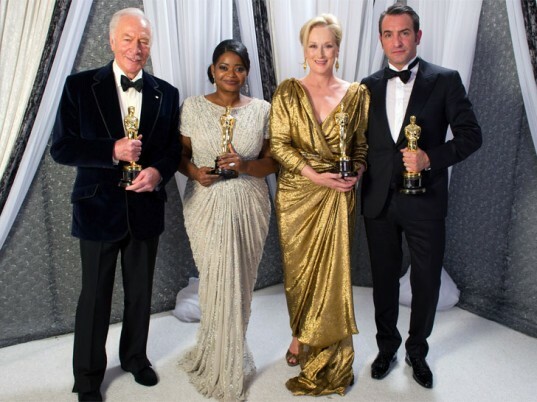 From an Oscar-wielding "Iron Lady" to two of Britain's national treasures, here are the marquee names who turned the red carpet green at the 84th Academy Awards. Three-time Oscar-winning actress Meryl Streep, who clinched the Best Actress award for her critically acclaimed turn as Margaret Thatcher, headed Livia Firth’s “Green Carpet Challenge” in a gold-lamé gown by Lanvin. 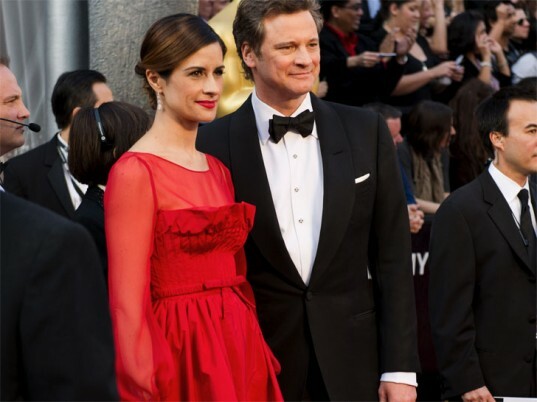 Firth wore a bespoke Valentino gown derived from a blend of silk and recycled PET plastic. “The resulting gown absolutely appeals to the romantic side of my nature, but has that high sheen that the red carpet demands,” the Eco Age creative director wrote. She accessorized with sustainably sourced (and traceable) pink diamond jewelry by Calleijia. 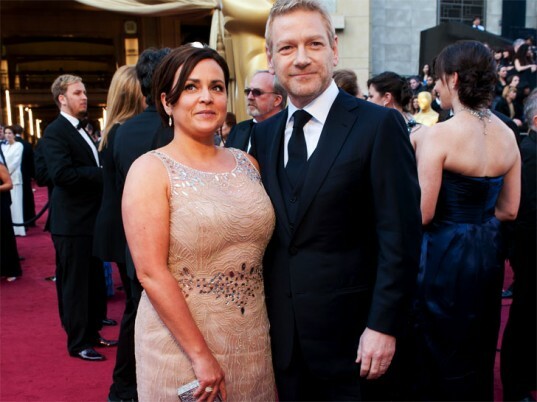 Her husband, Colin Firth, “recycled” his organic-wool Tom Ford suit from the 2011 Oscars, where he won Best Actor for The King’s Speech. The Artist actress Missi Pyle wore the winning design from Suzy Amis Cameron’s “Red Carpet Green Dress” competition. Valentina Delfino, who created the cruelty-free, mineral-dyed “peace” silk gown, was among hundreds of hopefuls who entered the contest. 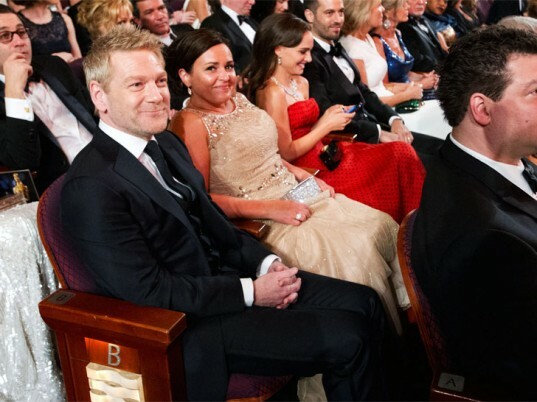 Kenneth Branagh, who was nominated for Best Supporting Actor for playing Sir Laurence Olivier in My Week With Marilyn, donned a custom-made Ermenegildo Zegna tuxedo made with eco-friendly merino wool. “The wool is sourced from Australian non-“mulesed” merino sheep,” Firth said. Also wearing Ermenegildo Zegna was Best Actor nominee Demián Bichir. “We went for a made-to-measure tuxedo designed with TROFEO 600 fabric, which is a blend of superfine wool and silk,” Firth noted. 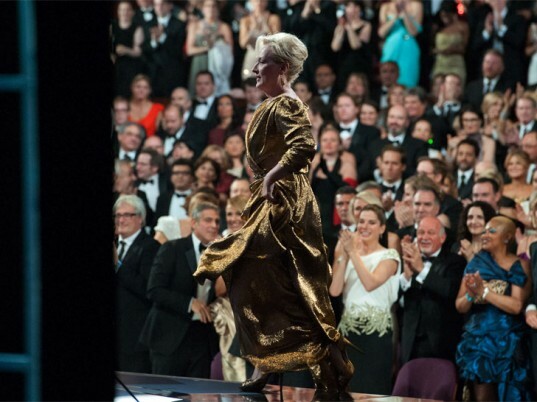 Three-time Oscar-winning actress Meryl Streep headed Livia Firth's "Green Carpet Challenge" in a gold-lamé gown by Lanvin. "The gown is gold, full-length and made from eco-certified fabric sourced with help from the GCC,” Firth wrote in her blog. “I could not be more delighted! Can you tell?" Streep opted for a pair of heels by Salvatore Ferragamo, Thatcher’s favorite shoe designer. 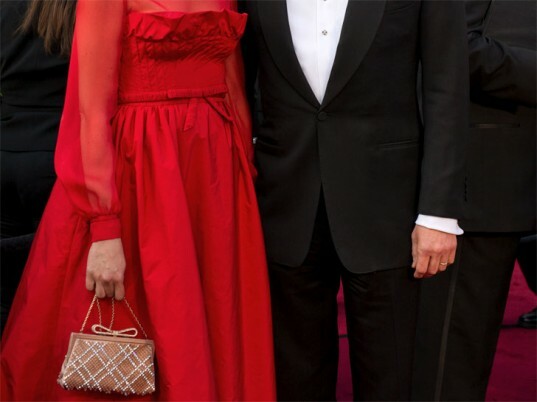 Firth wore a bespoke Valentino gown derived from a blend of silk and recycled PET plastic. “The resulting gown absolutely appeals to the romantic side of my nature, but has that high sheen that the red carpet demands,” the Eco-Age creative director wrote. She accessorized with sustainably sourced (and traceable) pink diamond jewelry by Calleijia. The Artist actress Missi Pyle wore the winning design from Suzy Amis Cameron's "Red Carpet Green Dress" competition. Pyle completed the look with shoes by Christian Louboutin and accessories by Stella McCartney. "The wool is sourced from Australian non-"mulesed" merino sheep," Firth said. Also wearing Ermenegildo Zegna was Best Actor nominee Demián Bichir. "We went for a made-to-measure tuxedo designed with TROFEO 600 fabric, which is a blend of superfine wool and silk," Firth noted.